The Google Play Store grows really really fast. There's no reason to try to pretty it up at all, because it's a simple truth: the Play Store keeps growing, and growing at a rate that most expected to be unsustainable. It's quite amazing really. It took about 2 years from the launch of the Android Market for Google to pull together 100,000 apps, and new predictions say that about 2.5 years after hitting that milestone, the rebranded Play Store is expected to hit 1 million apps by June. The numbers come from The Sociable, which is also kind enough to run down how the Play Store got where it is. Apparently, back when it was called the Android Market, it gathered just 16,000 apps in its first year (December 2009). As we mentioned, that number ballooned to 100,000 the year after that (October 2010). Just two years after that, we got the last official numbers the Play Store of 700,000 apps as of October 2012. The Sociable goes on to predict that there are currently 800,000 apps in the Play Store, which will rise to 900,000 by April, and then hit the big 1 million around June of 2013. And, since the Play Store has been growing faster than the iTunes App Store for a while now, it can be assumed that Google will hit the 1 million app mark before Apple does. The iphone/pod/pad is more about novelty shovelware games more than cool functional apps. I never use my phone for games, I have a PS3 on a 51" plasma (Samsung of course) for that! hopefully theres a 1 cent sale!!! LOL, an end of the world sale? I love Google, Android and all the manufacturer that is making Android phones! If it gets a million apps by June its around my birthday. 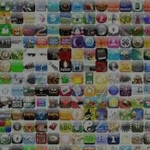 Apple's App Store already hit 1 million apps submitted back in November according to Appsfire. However, unlike Google, Apple actually reviews every app submitted and weeds out the garbage, so the total available in the store at this point is a lower number. App numbers are pointless when you allow anything and everything into your store as Google does. One estimate by AppBrain put the amount of spamware in the Android Marketplace at 45% of all apps. For developers, the more important number is revenue. On this count, Apple's iOS App Store completely kicks Google and Microsoft to the gutter with Distimo reporting that iOS App Store revenues were 430% larger than Android during 2012. Distimo notes that just "the daily growth in the Apple App Store was higher than the total daily revenues in Google Play when comparing absolute daily revenue values." Flurry reports that during Jan-Feb 2012, total revenues (including paid and advertising revenue) per user for apps from the Google Play store were 23% that of iOS apps. Note that during 2012, Flurry reports that only 23% of app revenue came from advertising. In Games, the largest most popular category, NewZoo reports that iOS users generate 84% of all mobile games revenue. All in all, whether the number of apps in the Google Play Store surpasses the iOS App Store anytime soon is completely meaningless when quality, outright purchase revenue, in-app revenue and advertising revenue for developers are all a small fraction of Apple's App ecosystem. lol, you do realize that there like 250k apps on the APPLE appstore that have nevere been touched, and another 200k or so just for the ipad? Right? Also, since I am not an employee of either company I do not care about their revenue...I like free apps, myself. Developers don't like free apps so that's why the quality of apps is so much lower on the Google Play store on average and why so many developers don't create apps for Android full stop. There are 43,000 iOS developers vs only 10,000 Android developers according to AppStoreHQ, so Android users are missing a great deal. Oh, and most of those 275K iPad apps are actually universal meaning they work on all iOS devices, not just iPads.